Welcome to the new edition of the Inclusive Growth Bulletin! Our team is proud to present a new issue of the Policy in Focus magazine, discussing the Graduation Approach. The rationale behind this issue is to provide a diverse collection of articles that can hopefully contribute to a better understanding of the origins and ongoing transformations of the intervention, its potential drawbacks, and its interactions with social protection. We also bring new publications on the implementation of the Purchase from Africans for Africa (PAA Africa) programme in Niger and in Senegal, and the latest news and updates regarding the IPC-IG's activities. 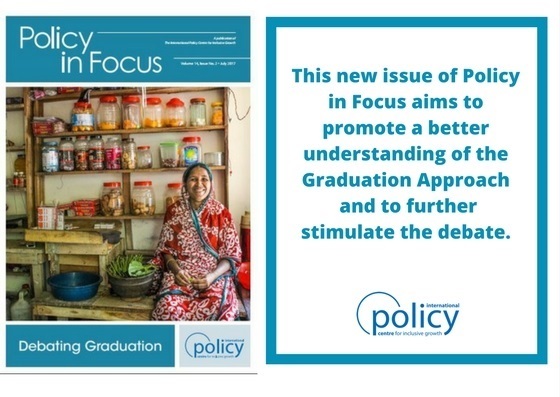 The IPC-IG is pleased to present a new issue of the Policy in Focus (PIF) magazine, dedicated to the Graduation Approach. This issue, titled ‘Debating Graduation’, features specialist guest editors Fabio Veras Soares and Ian Orton and presents 15 inspiring articles that capture the diverse and challenging views comprising the debate surrounding the Graduation Approach, ranging from committed proponents and enthusiastic new implementers, to the cautiously optimistic, to outright critics of the intervention. The enthusiasm with and controversy over the Graduation Approach as an effective set of interventions to reduce extreme poverty date back to the beginning of the last decade. In 2002, the Bangladesh-based non-governmental organisation (NGO) BRAC launched a programme titled ‘Challenging the Frontiers of Poverty Reduction-Targeting the Ultra Poor’ (CFPR-TUP), a mix of interventions designed to support the poorest of the poor families in the rural areas of the country. The objective of the first phase of the CFPR-TUP programme was to assist the most vulnerable families in achieving sustainable livelihoods, through a combination of one-time asset transfers, access to health care, trainings, safety nets and savings promotion, among other elements. Through the programme, households would be able to create a pathway—or ‘graduate’—out of extreme poverty within a specified time frame. This methodology came to be known as the ‘Graduation Approach’. Since its inception in Bangladesh, there has been a proliferation in the implementation of new graduation-inspired programmes worldwide. However, this enthusiasm and increased visibility have not been free of controversy. Concerns remain regarding targeting efficacy, equity and what happens post-graduation. Read more here. This new issue is available as a free download in English, in PDF and smartphone/tablet-friendly formats. 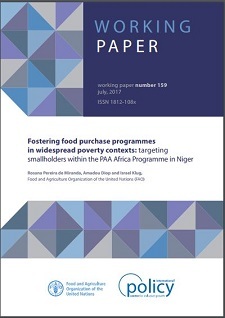 In the Working Paper ‘Fostering food purchase programmes in widespread poverty contexts: targeting smallholders within the PAA Africa Programme in Niger’, Rosana Pereira de Miranda, Amadou Diop and Israel Klug (FAO) provide a detailed description of the implementation approach adopted in Niger as part of the Purchase from Africans for Africa (PAA Africa) project. The paper discusses how targeting vulnerable smallholder farmers can be successfully implemented in the context of an institutional procurement programme. In Niger, the PAA Africa programme has been operationalised by FAO and the World Food Programme (WFP), in collaboration with the decentralised services of the Ministry of Agriculture, the National Institute for Agronomic Research and farmers’ organisations. This Working Paper, together with its companion One Pager, is available in English. In the Working Paper ‘Targeting farmers in institutional procurement programmes: case study of the PAA Africa programmes in Senegal’, Rosana Pereira de Miranda, Abdoulaye Thiam and Israel Klug (FAO) analyse how the targeting approach adopted by the PAA Africa Programme in Senegal has led to constraints and influenced the results observed in the programme’s pilot phase. The PAA Africa programme in Senegal targets rice-producing family farmers in the region of Kédougou, one of the most vulnerable regions of the country. In Senegal, the PAA Africa programme is being operationalised by FAO and the WFP, in collaboration with the decentralised services of the Ministry of Agriculture and Rural Infrastructure and the Ministry of National Education. This Working Paper, together with its companion One Pager, is available in English. To learn more about PAA Africa, we invite you to also read the One Pager ‘Phase II of the PAA Africa programme: results and lessons learned’. The One Pager ‘Grievance mechanisms for social protection programmes: stumbling blocks and best practice’, by Valentina Barca (Oxford Policy Management - OPM), is now available in French and Spanish. The One Pager ‘Effects of domestic worker legislation reform in Brazil’, by Joana Simões de Melo Costa and Ana Luiza Neves de Holanda Barbosa (Institute for Applied Economic research—Ipea), and Guilherme Hirata, (IDados, Alfa e Beto Institute), is now available in French and Spanish. The study was previously available in English and Portuguese. The IPC-IG has launched a Call for Articles for the next issue of its flagship publication, the Policy in Focus magazine, to be published by November 2017, which will explore how non-contributory social protection is changing in countries in the Middle East and North Africa region (MENA). This publication will be led by specialist guest editors Rafael Guerreiro Osorio and Fabio Veras Soares. The issue will be tentatively titled ‘Social protection in MENA today’. 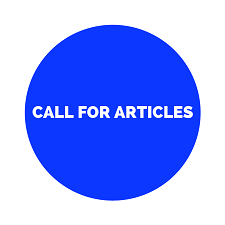 The IPC-IG would like to invite potential contributors (scholars, policymakers and policy practitioners) to send an expression of interest proposal by email to publications@ipc-undp.org, with the subject line “PIF MENA article proposal”, by no later than 28 July 2017. Proposals must briefly detail the scope of the proposed articles, co-authors (if any), and institutional affiliation. The final article submissions should be presented in English and are expected to be under 2,000 words, fully referenced. Proposals will be examined by the Centre’s editorial board regarding their alignment with the issue’s Concept Note. Selected authors will receive an individual notification confirming the acceptance of their articles, along with full guidelines for article submission. The final deadline for article submission is 21 August 2017. Read the full Concept Note here. Our colleagues and partners at socialprotection.org will host the webinar ‘Lessons for the universalization of health care in emerging economies’ on 27 July. Organised by the United Nations Research Institute for Social Development (UNRISD), this webinar will explore the opportunities and challenges facing developing countries as they seek to expand and universalise their health care systems. It will look closely at the cases of Brazil and China, and broadly discuss the experiences of Thailand, Russia, South Africa, India, Indonesia and Venezuela. Please click here to complete your free registration to the webinar. The IPC-IG hosts the socialprotection.org online platform. 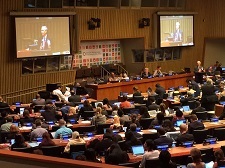 IPC-IG's Senior Project Officer, Mariana Balboni, is attending, as an observer, the High-level Political Forum on Sustainable Development, which is organised by the United Nations Economic and Social Council (ECOSOC), at the UN Headquarters, in New York, from 10 to 19 July. The forum will discuss the follow-up and review of the 2030 Agenda for Sustainable Development and the Sustainable Development Goals. Ms. Balboni has also participated in the 2017 High Level Political Forum Side Event, titled ‘Global partnership on universal social protection: ending poverty by 2030’, on 10 July. The event has been organised by the Governments of Finland and Malawi, the International Labour Organization (ILO) and the World Bank, and co-sponsored by the Social Protection Inter-Agency Cooperation Board (SPIAC-B) and the Global Coalition for Social Protection Floors (GCSPF). The IPC-IG is accepting applications from outstanding students for its 2017 Internship Programme. We are looking for graduate-level students who are passionate about international development and who believe that inclusive growth, the dissemination of knowledge and social development have the power to transform societies. Requirements and information on how to apply are available here. If you know someone who would be interested in joining the programme, help us spread the word.